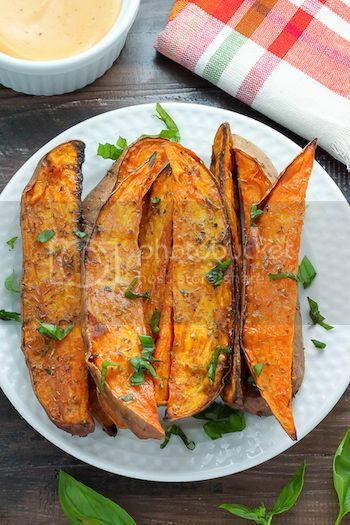 Creating some spiced chips from kumara (also known as sweet potato) is a great way to add some variety to a dinner meal or to have as a snack, but I particularly enjoy these wedges as a quick and easy lunch. They keep well in the fridge overnight if I need to take them to work the next day, and people are always commenting that my lunch smells nice and they want to know what it is. Here is the recipe so you too can enjoy this tasty treat! Note that this is for one person – double the ingredients for two people and slightly increase the cooking time. Peel the kumara and then cut it into thin slices or wedges. The thinner you make the chips, the less time they will need to cook and the crispier they will get! Lay the chips flat onto an oven tray and do not overlap the slices. Drizzle with the oil and then sprinkle the mixed spices evenly over the chips. Bake for 15 minutes and then flip the wedges. Cook for a further 10 to 15 minutes more until they are brown and crispy. Sprinkle with the parsley or chives, then serve and enjoy! Include the option of sauces for your guests in case some don’t enjoy too much spice! BBQ sauce and ketchup are good choices. If you really enjoy spicy food, then add some garlic or chilli (either thinly chopped or their powder forms) to the recipe, or add extra curry powder! Alter the spices depending on your tastes. Others that complement this recipe include thyme, oregano, and cumin.